Calcium is a white substance that comes from seashells as old as hundreds of thousands of years and that can be found in the ground. It is made of two minerals, calcium and magnesium. Our drinking water, which we mostly get from groundwater, contains lime. Areas that contain a lot of calcium and magnesium ions are called hard water areas. In these areas, limescale can occur when heating or boiling water. Limescale can be recognized by the white layer it leaves behind on tiles, faucets, water lines or in toilets. Water that's as hard as three German degrees or more already causes noticeable limescale. When heating water, carbon dioxide is realised, which reacts with calcium hydrogen carbonate and magnesium hydrogen carbonate in the water. This causes limestone in the form of the solid substance calcium carbonate (and, because of the magnesium, also magnesium carbonate). Why is limescale a problem? Limescale (calcite) is a bad head conductor, which means there's less efficiency and more loss of heat when using, for example, a central heater or other water-based heaters. You will receive a higher gas bill. A limescale layer works as an isolator. Because it also narrows the water lines, it costs more energy to heat the water: 1 mm of limescale means 7.5% more energy costs, 1.5 mm – 15%. Moreover, the limescale can damage the heater. Because soap dissolves in hard water, more soap is needed to create foam. Limescale because of water is a big problem in many companies and households. 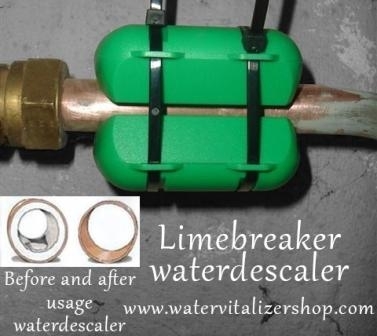 How does the Limebreaker water de-calcifier work? Simply put, limescale is formed because the necessary and healthy minerals calcium and magnesium crystallize (see image 1). This 100% eco-friendly de-calcifier changes the existing crystal structure, based on a unique and balanced magnetic field, without removing elements and without adding harmful substances. 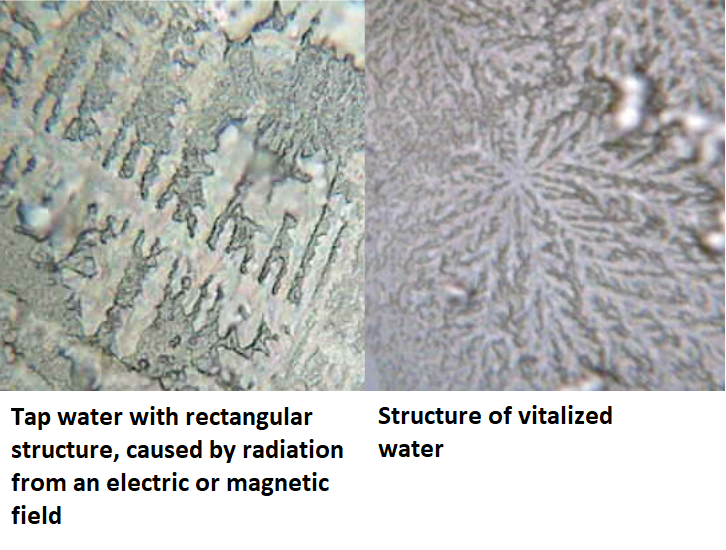 The (healthy) minerals remain in the water in their original state (see image 3). The effectivity of the limebreaker is dependant on the hardness level of the water. In any case there will be less limescale in the shower or other apparatus. Existing lime scale in the waterpipe will in any case be dissolved. The mineral structure of the water doesn't change. Limescale in all sorts of appliances, on tiles and in the shower, are much less strong. The problem of limescale has been greatly reduced because of this. Limescale is coarse and doesn't wash away, after using the de-calcifier the new form of lime is less sticky and can be easily wiped off or removed while cleaning the shower. It turns out, like we already know, that the vitalizer also works as a descaler. A combination of the descaler and the vitalizer, or two vitalizers (of which one can be small, and the other one big), results in evidently even less lime scale. The effectiveness depends on the hardness of the water. A big advantage of the descaler is that it can easily be placed in the meter cupboard on the main line, so it effects the whole house, and it also cleans the whole piping system from limescale. Especially a combination with a main line water vitalizer is useful to reduce the lime in the entire house and the piping system. A small vitaliser is a singlepoint treatment for only 1 application such as shower, faucet or recessed-watervitaliser. During this process the lime is not removed from the water pipe. A lime breaker also works for the entire House – and is perfect to combine for both options. "I have a vitalizer for the entire house and a Lime Breaker water descaler. With this I create, in Groningen at 10 German hardness degrees, only a little bit scale, which is not a big problem if the shower is normally cleaned." The effectiveness is, with the descaler as with the vitalizer, dependent on the hardness of the water. Please contact us for advice on your situation. Why is the combination of a water de-calcifier and water vitalizer essential for water with a high quality and a high vitality? This water de-calcifier is beautifully combined with a water vitalizer. The de-calcifier dissolves the minerals (which includes the lime) and makes the water soft, light and easily drinkable. The vitalizer gives the water harmonious frequencies afterwards; a vital structure that contributes to a healthier body is created. If you would only use a de-calcifier, the magnetic field that it generates would have a harmful effect on the vitality of the de-calcified water. It causes the water to form odd angles. When using a water vitalizer structures are created that look like harmonious branches. You can see the differences in structure beneath. Information about the optimal combination of water treatments for the best drinking water, like de-calcifying, filtering and vitalizing. Works without salt, without electricity and is 100% maintenance free. A big decrease of limescale dependant on the hardness of the water. Dissolving of existing limescale in the water pipes. The surface tension of the water becomes lower, which increases the dissolving capabilities of the water and ensures that the minerals remain dissolved in colloidal form, making them easier to digest for man, animal and plant. No loss of space in the meter cupboard. Only one system needed for the entire house. Life long technical (exchange) guarantee. The producer is ISO 9002, ISO 9001:2000/2008 and QA certified. Possible savings from €250,- to €500,- per year. No loss of pressure in the water pipes. No noisy water pipes/faucets anymore. Less frequent need to clean the whirlpool, jacuzzi and swimming pool. Less flocculant needed, pH+, pH- and chloride in swimming pools, jacuzzis, etc. Less need for chemical cleaning and softening agents. No need to wipe or dry the showering cabin, windows or car. Lower energy bill (up to 20% savings possible!). Coffee and tea taste better. Water doesn't smell stale anymore. Clean dishes without rings and water stains. 30-50% less soap and washing detergent needed. No need for fabric softener. No need for softening salts in the dishwasher. Much less brightener needed for your dishwasher. Up to 20% savings on energy when heating the house or water. No unnecessary maintenance of appliances because of lime and limescale. No early replacing of expensive appliances. No more skin irritation because of lime. Less itching and skin irritation after using a bath or shower. No need to scrub the kitchen and bathroom anymore. Prevents water stains on cleaned windows or for example the car. Layer by layer, the old existing limescale, kettlestone or limestone is broken down, until eventually it disappears in a fine powder form (see image 2, above). It almost completely disappears with the regular flow of the water without causing clogging, and new limescale doesn't stand a chance any more (see image 3, above). This way, the old limescale is near completely removed and new limescale doesn't form any more. Appliances, water pipes and heating elements become cleaner and remain almost completely limescale-free. Installation is simple and takes place in the meter cupboard, basement or technical space, almost always without any sawing, breaking or cutting. What does the Limebreaker water de-calcifier cost? The price of this de-calcifier depends on the type of water pipe, the thickness of the pipe and the hardness of the water. 1. Look in your meter cupboards or where the water meter is placed, or in case of an apartment, where the main water line enters the house. 3. Determine the hardness of the water in your area by contacting your local water supplier. 4. Make your choice: there is a fitting solution for stubborn limescale problems for nearly any situation. In the table below you can determine which de-calcifier you need and how many elements. You will get a 4 month satisfaction warranty on this professional water de-calcifier and 25 years of manufacturer warranty on the technical functions. How does the magnetic system dissolve the lime? By applying the magnetic system, the lime will settle in small parts and will then be flushed away by the flowing water. In still water, the lime will almost cease to create hard kettlestone, but a much softer residue that can be easily wiped away with a towel or brush. In fact, this de-calcifier functions as a lime-conditioner when it enters the water lines. The minerals that cause limescale, like calcium carbonate, calcium sulfate, magnesium hydroxide, calcium phosphate and silicates, are not removed by this magnetic treatment, but are kept in floating solution. That is to say, they will settle much less in hard crystallized forms. A condition for this is that there is a periodical water flow through the treated water line. The de-calcifier offers a permanent, preventive solution to a stubborn problem, however the effectivity is dependant on the hardness level of the water (Less hard water, better results). The results of the research as well as the visual effects are supported by these consulted literary sources. - Lundager Madsen, H.E., Influence of magnetic field on the precipitation of some inorganic salts. - J. Chr. Growth, 15, (1995) 94-100 2. Alimi, F et all, Influence of magnetic field on calcium carbonate precipitation. - Desalination 206 (2007) 164-168 3. Botello-Zubiate, M.E. - Influence of magnetic water treatment on the calcim carbonate formation and the electrochemical corrosion behavior of carbon steel., J. All. Comp 369, (2004) 256-269 4. - Fathi, A. et all, Effect of magnetic treatment on homogeneous and heterogeneous precipitation of calcium carbonate, Wat. Res., 40 (2006) 1941-1950 5. - Gabrielle, C. et all, Magnetic water treatment for scale prevention, Wat. Res., 35 (2001) 3240-3259 6. - Kney, A.D. And S.A. Parsons, A spectrofotometer-based study of magnetic water treatment: Assessment of ionic vs. surface mechanisms., Wat.Res., 40 (2006) 517-524 7. - Armiri, M. e.a. On reduction in the surface tension of water due to magnetic treatment, Coll. Surf. A 278 (2005) 252-255 8. - Kobe, S. e.a. The influence of the magnetic field on the crystallisation form of calcium carbonate and the testing of a magnetic water treatment system, J.M.M.Mat. 236 (2001), 71-76. Comparisons between the Limebreaker de-calcifier and a salt softener. Does this system prevent the settling of lime in water pipes and heating appliances? * Did you know that limescale conducts heat 300 times worse than copper, 180 times worse than aluminium, and 60 times worse than iron? This means that if you have a 1mm limescale on your boiler, it is the same as a 30 cm copper wall, or a 6 cm iron wall. In other words: to heat the water in a boiler or kettle that has limescale, you need to use much more gas to reach the same water temperature. Conclusion: if you use a different system to de-calcify your water, your gas and electrical bill will remain unchanged and too high, as the existing limescale is not removed. How do I know if I have 'hard water' at home? Ask your local main water supplier. If you see any white tarnishes on glass in the shower or on the flat spiral or the bottom of your water cooker, you definitely have calcium in your water. Incidentally, this is the case in over 93% of households (in the Netherlands). Calcium has to be present in (drinking) water – a small amount is already enough to be of hindrance. My water is soft or centrally de-calcified – I still experience limescale. How can this happen? Many main water companies suggest that soft or centrally de-calcified water doesn't cause any limescale problems any more. This is not true. At best, the limescale problems are lessened. It has been determined in the drinking water resolution (based on advice of the health counsel) that the hardness, for example through central de-calcification, can't be lowered beneath a minimum of 5,6 oD (and the World Health Counsel even advices a specific maximum hardness of 8,5 oD). This is because of your health, to prevent for example osteoporosis, erosion of teeth, loss of hair, hart and vascular diseases, etc. The amount of calcium in the water is reduced (a little), but definitely not completely removed and the remaining (necessary) calcium is still destructive to your pipelines and appliances. It's just the time frame in which it happens that it's extended a little bit. Moreover, the presence of certain organic and inorganic substances plays a big role in creating limescale. These can partially prevent or encourage the growth of limescale. This is why, even when you have a (relatively) low water hardness and your water is centrally de-calcified, you will still experience limescale problems. Is a four month guarantee on the professional module long enough for a good test? If the water softener is placed, the system will work immediately. Because of this, you will notice the improvements from the very first moment. To still provide you with a sense of security, we have maintained the four month testing period continuously. Within this time frame, we take into consideration for examples holidays that might occur during the guarantee months. For a personal, precise quota that's free of any obligations of our professional products we will need some details, like the diameter and material of your water line, application and the targeted appliances etc. For more information, you can email info@watervitalizershop.com or ask for a quota through our quotation form. What if my de-calcifier breaks? Will I receive a new one? We are so sure of the quality of our professional water softeners, that you get a 25-year technical (exchange) manufacturer guarantee. We can live up to this because in the quality system that we use, every module is tested before it leaves the manufacturer. Moreover, none of our modules requires any maintenance, they are shockproof, safe, don't use any electricity and are heat-, ice- and water-resistant. Will I get my money back if I'm not satisfied? Everyone who is unsatisfied with the professional Limebreaker water de-calcifier after the first four months will be reimbursed for the full amount of purchase of the delivered module after sending back the undamaged product. Will it take long for the de-calcifier to be installed? We can send out our products straight from our stock, and after we've received payment you may expect the water softener to be delivered within about two (business) days. The installation itself usually takes only a couple of minutes. Our water de-calcifiers are always delivered with an explicit installation manual. Are there any additional charges after the purchase? There are no additional charges. Because the water is now heat-conducted more easily, you will actually save money on your usual bills and water related appliances don't experience wear and tear because of limescale anymore. These savings can add up from €250,- to €500,- per household per year, every year. The de-calcifier doesn't use electricity and is 100% maintenance free. After the 'old' water in your water lines had been replaced by the soft water of the de-calcifier, you will almost immediately notice the difference (usually within a couple of days): the water feels softer, doesn't smell stale anymore and looks clear and sparkling again. Drinking glasses will leave your dishwasher without stripes or water stains, even without brightening agents, and you will use up to 30% less washing powder (depending on your water hardness level). Within a couple of weeks you will have experienced all advantages yourself. From the moment that you have installed the Limebreaker water de-calcifier you will notice that less new limescale will settle. Our advice is to clean the shower from limescale before use, so that you can notice the difference. The longer the Limebreaker de-calcifier does its job, the more distinct the results become and the more indispensable it becomes in your household. What is the influence of the water de-calcifier on the environment? Its effect on the environment is considerable. You will need 30% to 50% less soap and detergent and no brightening agents or fabric softener. Salt in your dishwasher will last much longer. Your energy bill for heating water can reduce up to 25% because the heating elements, appliances and water pipes are being cleaned by the module and the water heats up much faster. It increases the supply and drainage of water which in turn improves the function and life expectancy of your expensive appliances. Yes, one hundred percent. The Limebreaker water de-calcifier has a non-systematic function, which means that there are no healthy elements, minerals or other substances added to nor detracted from the water flow. The module, or parts of the module, are also not in direct contact with the water. The present and healthy particles in the water are only enhanced in function after placing a Limebreaker water de-calcifier. Research by KIWA (BTO 2000.01) has confirmed that this system is completely safe; the system has no influence on the copper dissolving abilities of the (inside of) the water lines. Based on our own research, we have known this for many years.